I ran into an old friend at the grocery store. We exchanged pleasantries and updates on what we’ve been doing. I noticed that we were both talking about how busy we were. With me, it’s a combination of different things. I’m busy with work on my blog. Creating content, answering emails, collaborating with brands and engaging on social media. Add hours of housework, meal prep, shuttling around my daughters to lessons, friend’s houses and appointments. Where does the time for fun fit in? The answer is you have to make some time for it. Schedule it in or whatever you need to do. We all need to relax and let loose even with our busy schedules. 2016 is a leap year. Take that extra day this month and do something fun with your family. Don’t let the winter stop you! Obviously, you won’t want to go out in -30C, but on the warmer winter days, head outside. There are many ways you can embrace winter and enjoy yourself with people you love. 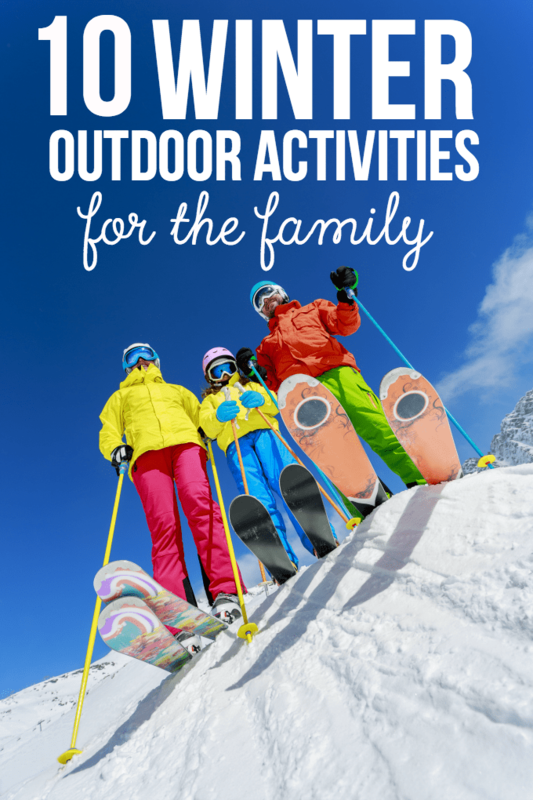 Check out these 10 fun winter outdoor activities to try! 1. Go snowshoeing. Scout out the local scenic trails in your area. I googled snowshoeing in my local area and found that the Petawawa Public Library rents them out. I’d love to check out the Petawawa Research Forest’s trails. I went snowshoeing there with my class in grade two. 2. Build a snow fort. You won’t have to go far to do this winter activity. Head out into your backyard. If you live in an apartment, a local park will also work. Bundle up, grab a cup of hot chocolate and get started! 3. Make snow angels. Again, another activity you can do right in your yard. Pile on the winter gear and flop yourself down in the snow. You are never to old to make a snow angel, in my opinion. 4. Visit somewhere new. Think about planning a short getaway to explore some of Canada’s amazing winter destinations. I recommend skating on the Rideau Canal in Canada’s capital. Another idea is the Northwest Territories to take in the Northern Lights. I witnessed their magical beauty once when I live in Edmonton. 5. Make a snowman. Look for that perfect snow that is not too wet or dry and make a snowman family for your front lawn. Don’t forget the carrot nose! 6. Go skiing. Chances are, you aren’t too far away from a ski hill or ski trail. I prefer cross-country skiing. It’s good exercise for the whole family. I had a blast skiing on the Forest Lea cross-country trails as a child. 7. Go skating. Indoor and outdoor rinks are the perfect way to spend a few hours skating with your family. The outdoor rinks are free in our area while the indoor ones charge a small fee during family skating hours. 8. Play hockey. If you’re lucky at one of the local outdoor rinks and get there when it’s not busy, you may be able to swing a game of hockey with your family. Another idea is to build a rink in your yard or simply play street hockey in the driveway. 9. Go tobogganing. We are a two minute drive from the best hill in town – the Mother Hill as its known to locals. The hill is huge and you can get some good fast action with your sled. The walk up the hill is good exercise! 10. Hit the snowmobile trails. I adore snowmobiling and miss it dearly! Snowmobiling is so much fun. If you own one, take advantage of those crisp, sunny winter days and feel that adrenaline rush. At the end of the day, you may start to feel sore from the day’s adventures. For me, I know it’s coming, but it’s all worth it. 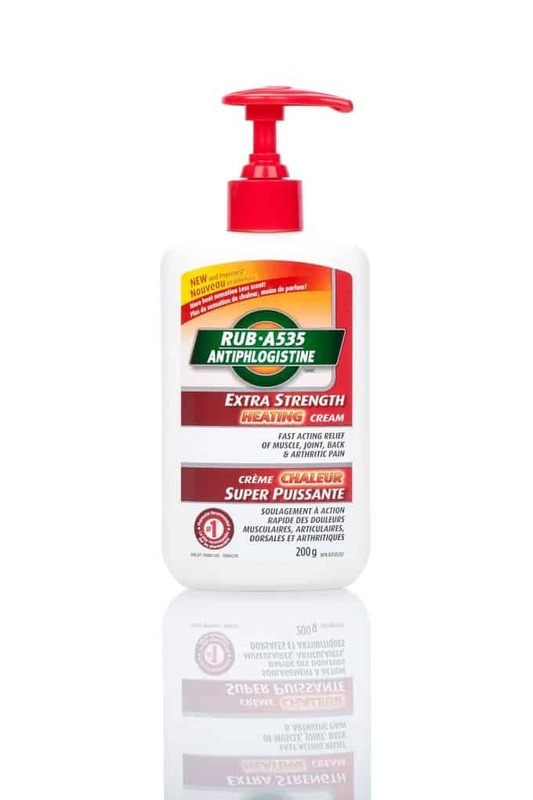 Grab a topical pain reliever like RUB A535™ Extra Strength Heating Cream to soothe those sore spots. It begins to work on contact and gives you fast acting pain relief of muscle and joint pain. What are your favourite winter activities? Tobogganing is so much fun! Great ideas! I’m not a winter person, I’m more of a sunshine and warmth type myself. We saw the Northern Lights here recently (we live just south of Edmonton). They surely are a magical beauty and I saw them quite a lot when living in MB, this play of lights and colours in the sky is a wonderful experience. The kiddos and I love being outdoors, and being so close to the Rockies, we spend a lot of time snowboarding, snowshoeing, or just generally hiking. I also run survival classes for them and others, especially during the winter. Important skill to have and the kids love it! My favorite winter activities are going for walks. the fresh air clears my head and my dog really enjoys it too. We love going skiing and ice skating in the winter. Haven’t tried snowshoeing but that sounds fun as well! Like you I love to go snowmobiling. I have not done it for a few years, so its time to get out there. we love tobogganing and tubing! I am trying to find something fun to do outdoors that the whole family will love, it’s hard but this list helps! We’d go up in the mountains and go tubing.